The Wright State University community can learn more about the progress of the strategic planning process and provide feedback during a Strategic Planning Open House on Friday, April 20, from 11 a.m. to 1:30 p.m. in the Student Union Hearth Lounge. President Cheryl B. Schrader will give brief remarks on the planning process at noon. The open house will feature displays of 15 strategic initiatives developed during the strategic planning summit in March. The strategic initiatives address a multitude of areas at Wright State, including academic programs, teaching and learning; service-oriented culture; campus experience for everyone; research and innovation; and strategic relationships and partnerships. Participants can also learn about and provide input on the revised statements for university values and areas of strategic focus drafted by the Strategic Planning Steering Committee. The Wright State University community can learn more about the progress of the strategic planning process and provide feedback during a Strategic Planning Open House on April 20. Over the summer, the steering committee and volunteers from the campus community will develop goals and objectives, establish prioritized initiatives and identify resources that will be incorporated into the strategic plan, The Wright Path to 2025: Pride, Transformation, Potential. Supervisors and managers are encouraged to provide employees with the time to attend the open house as business conditions allow. Through the strategic planning process, the university is creating an ongoing dialogue that encourages continuous reflection and revision of the community’s hopes and priorities. 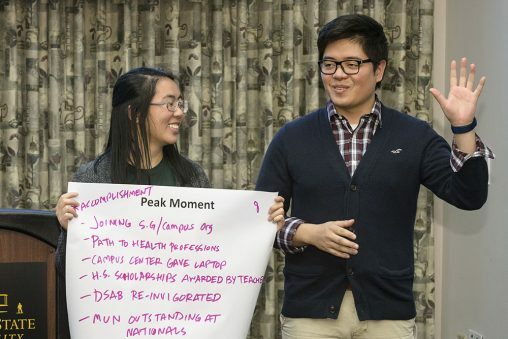 The planning process is designed to help faculty, staff and students engage and reconnect with others across the university and with partners in the broader community in meaningful ways. Over time, this process will help the Wright State community shape both its culture and future. The new strategic plan will guide Wright State University by creating a vision and focus that directly aligns resources with the community’s values, strengths and the strategy built around them. The planning process will put the institution in a position to thrive in higher education’s changing environment, help the university achieve financial sustainability, and foster a campus atmosphere that provides graduates with opportunities to excel in fields that define the future.